There are lots of times I get good hobby questions from readers asking about things I have a bad habit of taking for granted. In this case, it was as simple as "How do I get the arms to line up correctly on some of my models?" 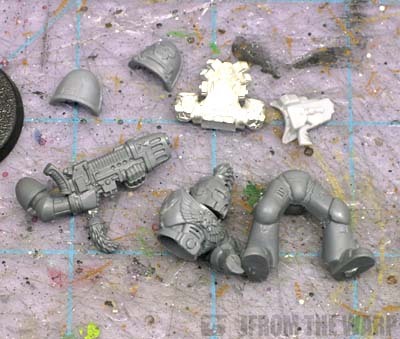 So let's take a look at getting arms attached and the whole process of assembling your basic Space Marine. And keep in mind, some of this info can be translated over to other forces too, it's not all just for Space Marines. When it comes to assembly, I start out with making sure I have all the bits I need to build the model in question. I'll cut them from the sprue and make a small pile of them to make sure I have everything before going any further. Once I have all the individual pieces, I'll go about cleaning all the mold lines from each piece. It doesn't take long to do, but it will add up over time. Still, it's a must do for me. I can't imagine trying to build and then paint a model with mold lines still on him. It can make trying to blend smoothly or add washes later on near impossible. As far as tools for this, we're not looking at much. A pair of sprue snips, X-Acto knife, some superglue and a bit of plasticard (which is not needed if you're using resin bases). I'm not pinning this guy so I'm not including that process here. I start with gluing the torso together and then gluing that to the legs that I've chosen for the model. That allows me to position the torso on the legs and make sure it's sitting on there correctly. I don't want it too far forward or back or twisted so much that it looks awkward and not anatomically possible... even though we're building superhuman marines here. Where the front and back halves line up at the shoulders on the torso. Sometimes there is a difference in thicknesses between the two halves. I will go in and clean up each shoulder joint until it is flat. This makes attaching the arms and getting a solid connection much easier. The top part of the legs where the torso rests needs to be smooth as well. This will ensure you get the best connection possible between the torso and the legs. Test fitting is very important! Once the body is built, I look at how my arms should rest on the model. It's known as dry fitting or test fitting the pieces. This is one of those things worth doing, believe me. Most of the time you'll never have any problems, but there will be that rare ocassion that you go to dry fit a bit in place and you realise you need to trim something or clean up an edge to make it fit the way you want. You're far better off doing it without any glue on the model than after you've added it. And you can repeat the test fitting process until you get the pieces together and you like how they fit. Then add your glue. Back to where we left off. Test fitting the arms. In this case, the gun is attached to the right arm already. That changes my assembly process slightly. And keep in mind this process is not set in stone, it's just the general method I use each time. If I get a particularly difficult model that needs to be done a differnt way, then I'll adjust accordingly so I get the results I want. Both arms are holding individual weapons. This is by far the easiest. Each arm can be attached independently of the other. I'm terribly spoiled as Terminators are like this. You don't have to worry about them lining up together. 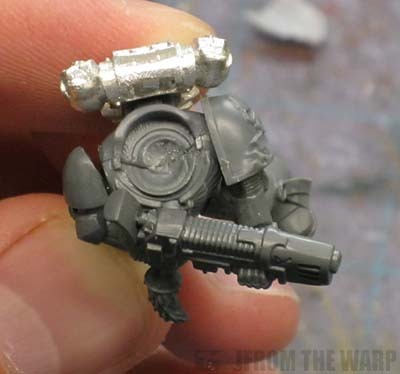 Outside of this option, you'll be needing both arms to hold a single weapon like a bolter or heavy weapon of some sort. Both arms holding a single weapon. Here it's going to be one of two situations, either the weapon is already attached to an arm (the right one usually) or it's separate from the arms and needs to be glued in place. With this, I'll glue the left or supporting arm in place first. I make sure it's in the position I want in terms of holding the gun up high or holding it down low. With it in place, I then attach the other arm holding the gun and glue it in the two places it connects to the model (the shoulder and the supporting hand). If in the procees of gluing the gun arm on in a case like this, it does not fit perfectly, I try and get the connection where it meets the supporting hand to look correct since that part will be seen on the model. 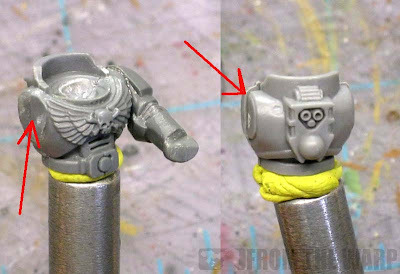 The gun arm shoulder joint can be fudged a bit since they (the shoulders) are almost always covered by huge, bulky shoulderpads. And you thought they didn't serve a purpose. In this case, I'll glue the right or gun arm in place first making sure it is in the position I want (holding the weapon up or down). Then I take the gun and hold (no glue) it in place on the trigger hand to see where I need to glue the supporting arm. Then I glue the supporting arm in that position. After that, I glue the gun place between the two hands. If in the process of gluing the gun in place, it does not fit perfectly, I try and get the connection where it meets the trigger hand to look correct since that part will need to line up most in order for it to look like the model is actually "holding the weapon in his hand." The supporting hand can be fudged a bit if need be. But what if our shoulder joints aren't flush? So what happens now if you had to fudge a shoulder joint and it's not the best connection in the world? Easy enough. To reinforce the connection, I take a bit of greenstuff and press it into the gap between the arm and the torso. You don't need much, just enough to fill the gap and make it a solid connection. Too much and it may cause problems when it comes to adding your shoulderpads. And... it doesn't have to be pretty either, it's going to be covered by the shoulderpads afterwards anyway. The arms are the biggest and hardest part really. After that, I'll dry fit the backpack with the shoulderpads to make sure all three pieces fit on the model correctly. If they do, I'll glue the backpack first and then the shoulderpads after that. What you're trying to do here is make sure that the shoulderpads don't interfere with attaching the backpack and the backpack doesn't keep you from getting the shoulderpads in place on the shoulders correctly. Once the backpack and shoulder pads are in place, this is the point where I'll add the head and any extras like purity seals, ammo pouches, etc. If I have the open space on the model, I'll carefully fit the extra bits on there. I do try and make sure not to clutter up the model too much though with extras. With the model complete, I add two small pieces of plasticard to the bottoms of his feet if I'm gluing him to a regular base. This is to prevent him from looking like he is slowly sinking into the basing material I'll be adding later on. I'll position him on his base and look at him from the top down to make sure he's centered over the base or positioned so that the base supports him and he doesn't fall over. In the case of troops with heavy weapons, they tend to be glued towards the back of the base since there is so much hanging off the front. With models wearing things like jump packs and wings, they tend to be glued towards the front since there is a bit more weight to the back of them. Once you find the best spot, you can glue the model to the base and then add your basing material. 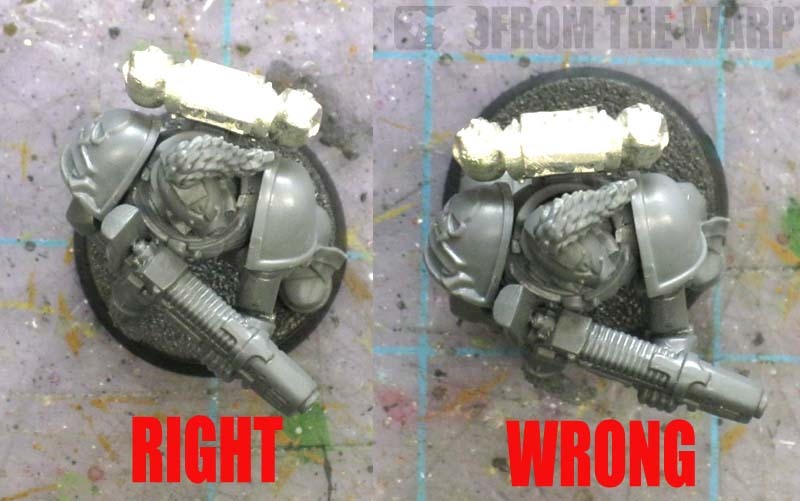 And that about covers the assembly process I use when building Space Marines. Hopefully this gives you an idea of the process I go through just for basic assembly. Keep in mind, you may need to alter the process depending on what your model is equipped with or how he's cast (hands connected to weapons, etc.) but the real trick to this whole thing is good test fitting BEFORE you glue something in place. It might seem like overkill sometimes, but that little bit of making sure it fits before you glue it can save you tons of work later on if you have to try and "fix" something you didn't test out first. I never thought to add the small bits of plasticard to the bottoms of the feet. Great suggestion! great basics guide. fantastic idea on the plasticard too, i'll be using that one. i find it interesting that the order people assemble their models is so different. i always (no matter what model i am making) glue the arms to the torso first, then the torso to the legs, and finally the head to the torso. 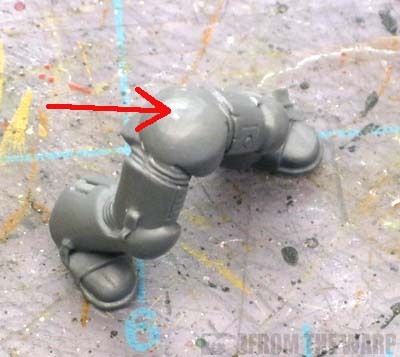 my reasoning is that the position of the arms is much more pre-ordained than that of the torso and head (which usually have ball sockets or can at least swivel). this means i can more easily put the model in a more natural position since the real choices are left till later on. Great article! So many good simple tips that can be over looked. 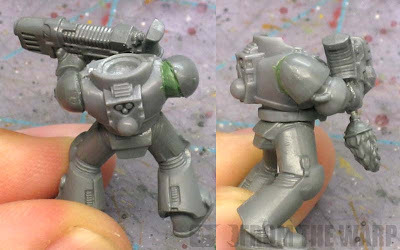 You add heels to space marine boots! Thanks guys, I thought I'd toss in the plasticard tip as it's the way I keep my guys from looking like they are standing in quicksand. I'll be posting links to this from my masteroftheforge.com where I'm trying to gather links to all the best articles and tutorials. 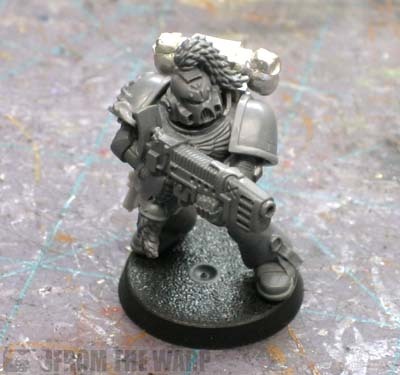 I was just building a Marine last night that is using the new Space Wolf Plasma gun with the molded on hands that you use in this article. This one really is a bit of a head ache and I wish I had read your article before hand! The right arm and should really does need greenstuff to get it in a natural position which is surprising given how good the newest GW plastics are. Brainwashed: Hopefully you were able to get him sorted out and put together in a good position. Now you know for the next time though!